I am both curious and frequently terrified of what I perceive to be a hybrid of human and animal faces in alpacas. Sometimes I catch an expression that freaks me out. I love the photos they render in general. I wish I can find them nearby. It's so cute XD This makes me want to have a pet alpaca. 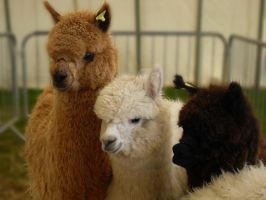 i love alpacas!! i saw a baby at a petting zoo, and went in every 10 minutes just to touch the baby alpaca! So sweet!!! <3 I love that! oh sweet i think i have a photo of some adults ! may u see ? Sorry for not asking but I used this photo and draw the idea in chalk and uploaded, giving you all the credits for the original photo. hope you don't mind u.u if you do tell me and I'll remove the photo. I think I just died from cuteness.